Watching this last night when I was tired didn't go too far, so I watched it this morning when I was super-awake. I kind of wish I'd watched it while I was tired so I didn't soak so much of it in. I'm really not liking this anime at this point. This episode was another all-focus one, as it was the annual sports festival. It's interesting to see that a lot of agencies compete together; I know that Johnny's Jimusho of Japan is large enough to hold their own. Anyway, 765 Productions was invited for the first time due to Ryuuguu Komachi's activities - once again, it's been shown that Ritsuko's in charge of something quite lucrative. I expected a happy-go-lucky episode, but this one chose to be filled with random new characters and angst, topped off with a happy ending. I probably despised it. 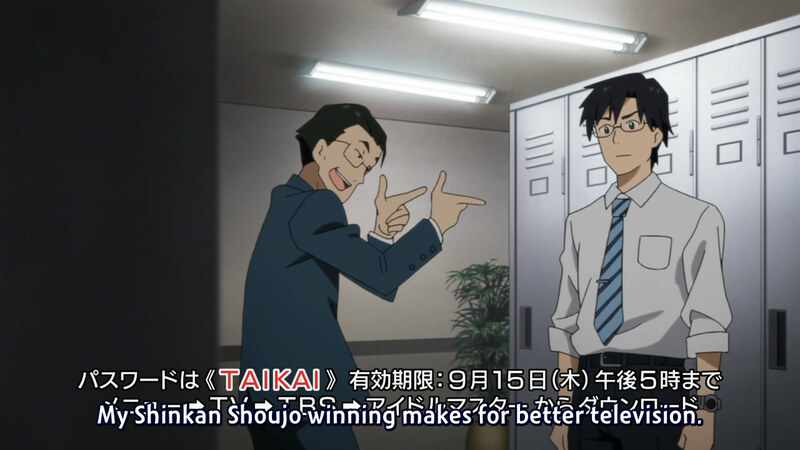 Takane is so uncouth sometimes. 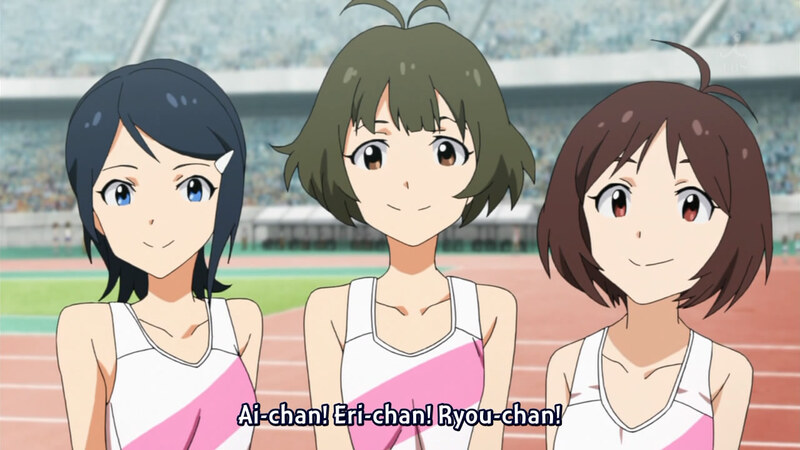 The episode began as the sports festival was already underway. 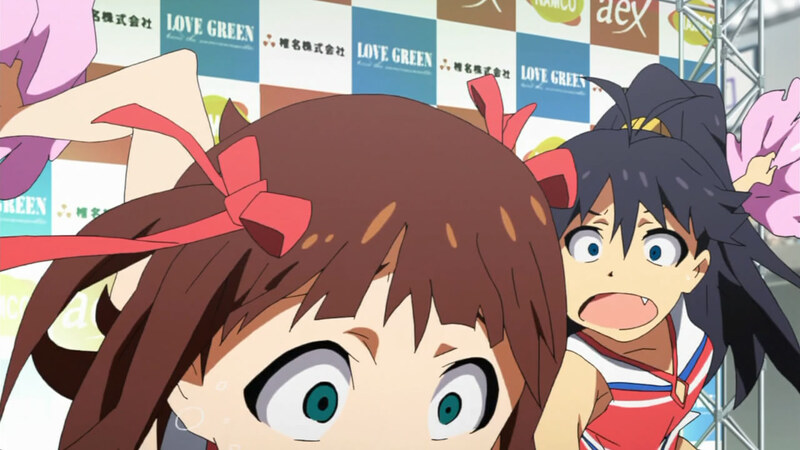 Iori and Makoto had been paired together in the 3-legged race, and had apparently fallen down. They were either fighting from the very beginning or had begun fighting after their unfortunate tumbling - either way, it was a theme that came back into play later on. 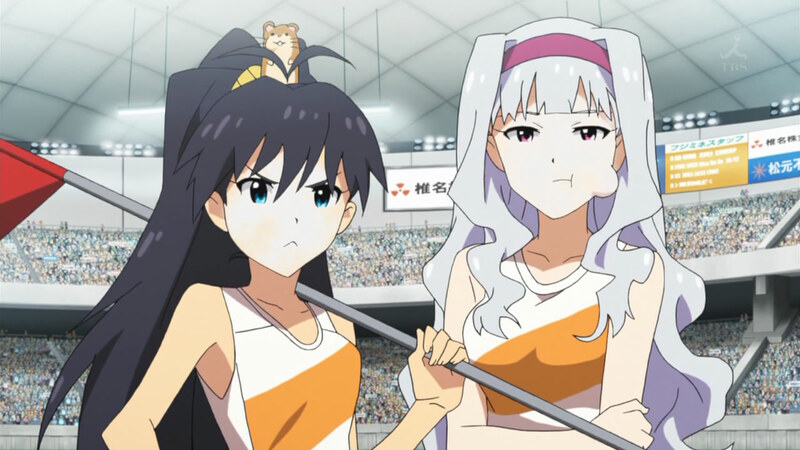 Hibiki and Takane returned from their match, having won first place. I know that Hibiki had to run into some kind of "sandbox" for the flag, but what was Takane's role? What was she eating? She looks like she might die. 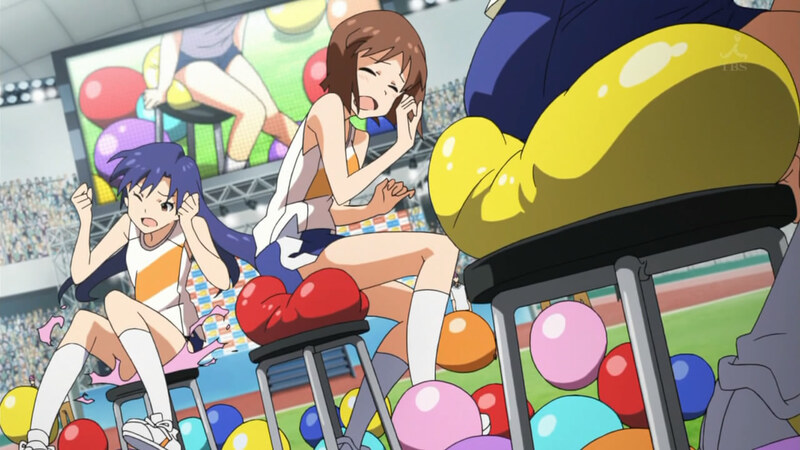 The first match shown in the episode was actually Azusa in the bread-eating contest. 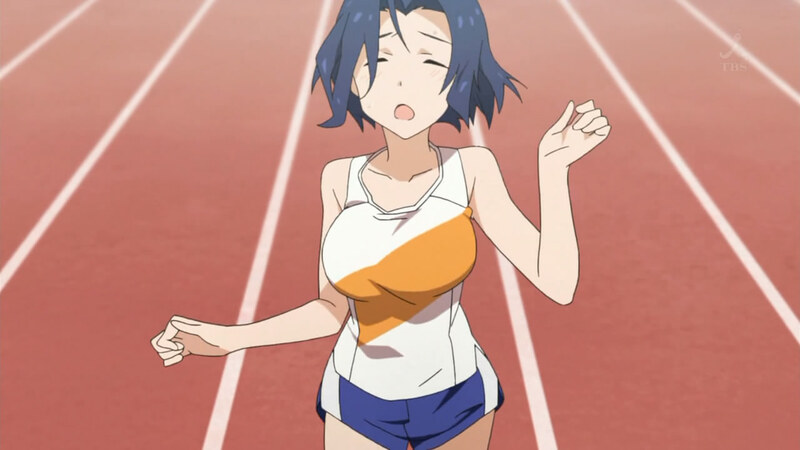 She was dead last, apparently due to being a poor runner and because her giant chest hadn't been bound. I wonder if they even took the competition seriously to begin with... She got a lot of attention, mostly due to her chest size, but also because of her cute and loveable ways. She took the match at her own pace, taking a bite of the bread and cooing that it was sweet, which caused the audience to go wild and the TVs to interview her after the race. More publicity for Ryuuguu Komachi, I see. After Ritsuko took the three girls of Ryuuguu Komachi away to rehearse (since they would be singing sometime later in the day), the other girls became very fired up when they realized that this was their chance to be on TV and shine. A montage of some very strange games began - sitting on balloons to break them while wearing bloomers? really? - and the disgruntled girls were once again shown (the previous one being the girl that had won the bread-eating contest but got no screen-time due to Azusa's charms). I wonder if they're villains. It's just not clear enough. The introduction of the girl group Shinkan Shoujo is pretty much what led to me hating this episode so much. It was a typical story of people latching onto a well-known group, and thus their own personal value sky-rocketed. I understand that it's a different type of society in Japan, one where the group matters more than the individual, but I dislike the negativity that's shown in a lot of depictions. This 3-girl group embodied the typical "shoujo girl scorned" archetype, commenting that the idols of 765 Productions were getting too full of themselves and that they should do something about it. How could she even lose balance and slam into Yayoi? The girls of Shinkan Shoujo went to work, with the black-haired one (looking kind of like Chihaya) up against Yayoi in some kind of wig-wearing sack race. I have to comment that this girl's wig seemed quite unfair; it looked like it held onto her head really well. On top of that, it had absolutely nothing sticking out that could get caught in the various obstacles. Regardless of those facts, she ended up losing, taking second place because she veered off-course and slammed into Yayoi (working super hard in a ridiculous pink wig). Putting her plan (of sorts) into motion, she commented to Yayoi after the race that 765 Pro had no chance with a burden like her on the team. ...sigh. Haruka defines "cute" as "clumsy". With their efforts not particularly succeeding, especially when Haruka and Hibiki got a lot of attention in the cheerleading competition (due to Haruka falling and taking Hibiki with her), the girls turned to their producer, who revealed that it had been decided that they would win. Thus, he would have a talk with Producer so that the 765 idols could stop standing out so much (though it wasn't said in so many words). Before I move on, I have to comment that I still don't see Haruka's charm. Nothing. Apparently, one of these is very close to a central character. To a degree, it really was your own fault. The plot point of Iori and Makoto's tiffs showed up again as the first match of the afternoon was a three-legged "borrowing" race. I still find it sad that the two can't get along and yet they were put together. For what reason? Why not Ami/Mami, who already act like they're joined together somewhere? Did you guys not want to win? Anyway, their fighting led to Makoto running at full-speed, something Iori couldn't keep up with, and the two of them fell. 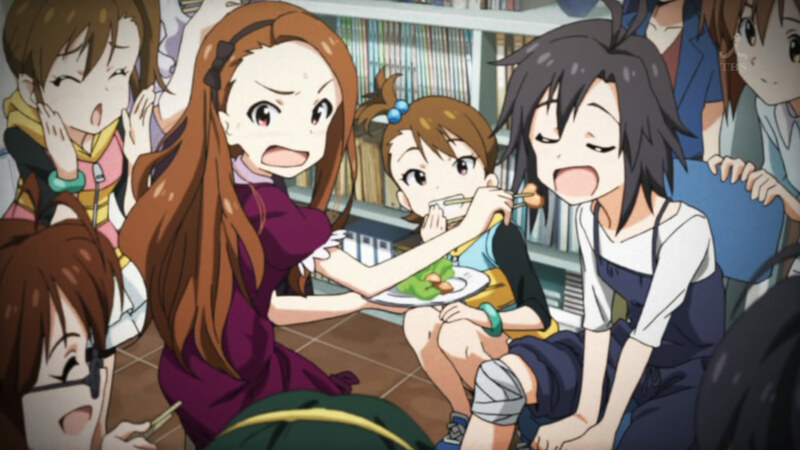 As Iori began to yell at Makoto, she realized that the tomboy had gotten hurt and immediately felt bad. Why? It wasn't really your fault. I don't understand the moral of the this story; if you're wrong, it's okay if you took some physical punishment for it? You were still wrong. You need to be told so you can change. Forbidden on multiple levels, too. 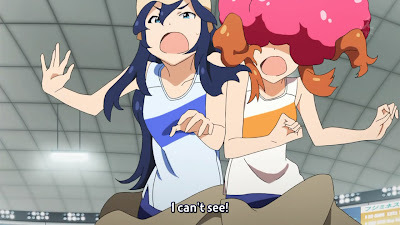 A funny moment did occur when the trio from Shinkan Shoujo came to heckle Iori/Makoto again. Names-wise, the one with the two ponytails is Tsubame and the one with the lighter-coloured hair is Hikari. So, the unnamed girl began the jeering by commenting that they had fallen again. 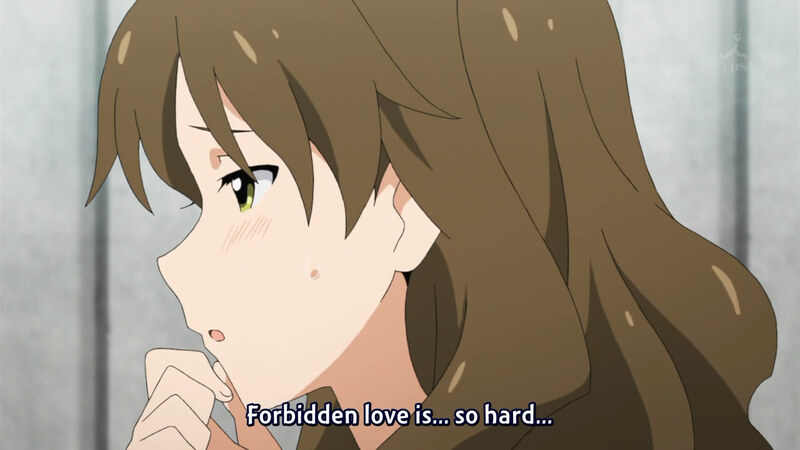 As Hikari began her lines, she caught sight of Makoto and instantly fell in love. 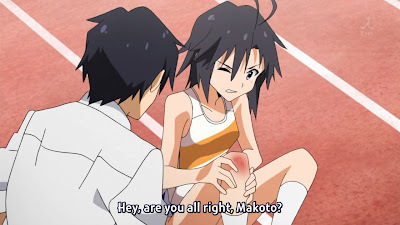 This obviously knocked her out of the running, as she forgot what she had to say and instead forced her handkerchief onto Makoto, running away shyly after. This continued throughout the remainder of the episode, adding a little bit of joy to the otherwise mundane personalities. Could he be any sleazier? As the girls wondered what to do since Makoto was out of the running (literally) for the final race, they finally noticed Yayoi's depression and confronted her about it. I'm glad that this plot point didn't continue into the next episode; I didn't really want to have to watch one of the idols being so emo without a cause, especially when she had been so head-strong and wilful earlier. 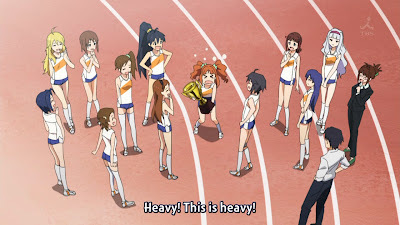 The girls resolved Yayoi's worries and Makoto decided to run despite her knee, while Shinkan Shoujo's manager met with Producer to give him some "hints" on how to proceed. I'm glad that Producer didn't hesitate at all in calling the president and asking if he had permission to do as he wanted (which was to not throw the game). He's still useless in many other ways, though. The scene was completed with Iori commenting to the manager that the main shareholder of his company was her family, thus taking away the threat of various cheating. The stage was set for the final race, which turned out to be an all-idol relay. 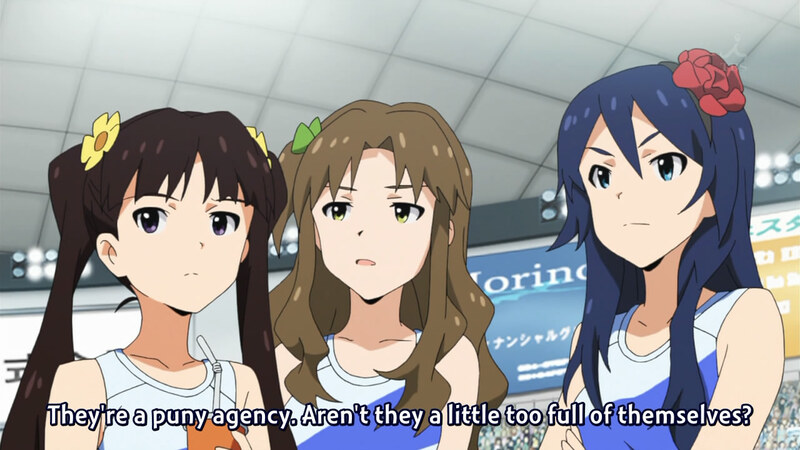 (Does that mean that Shinkan Shoujo's production house also has other idols? If not, it's pretty unbalanced and to the favour of 765 Productions.) I lost focus as the girls began running, spouting various motivating phrases as the insert song played in the background. 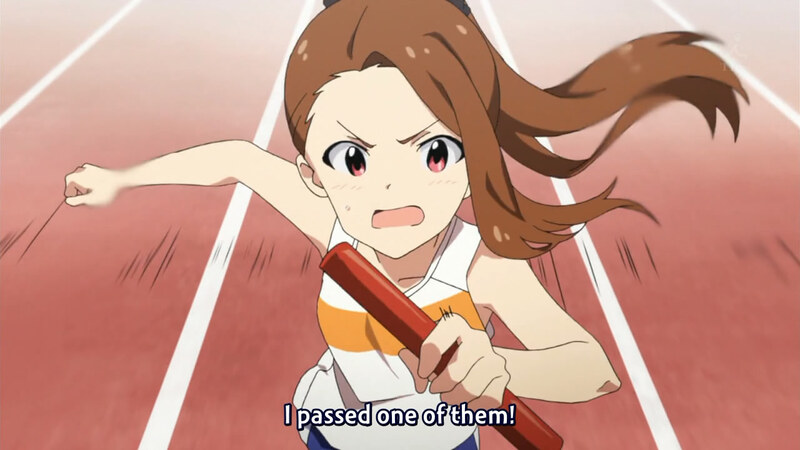 Iori was particularly interesting, though, as she and Makoto attempted to take back the lead that Yayoi had lost. 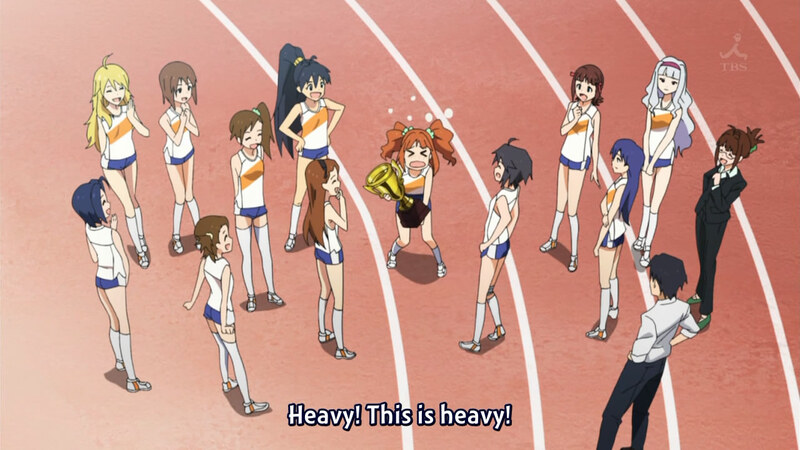 Yayoi had become very downtrodden as she was running and Iori (the next runner) cheered her on. She then proceeded to pass one of the runners, commanding Makoto to pass the rest. How does that make sense?! Anyway, Makoto did end up passing all the runners, as expected, and 765 Productions took the win for the sports tournament as a whole. The only male idols of the anime so far were introduced this episode - Project Jupiter. 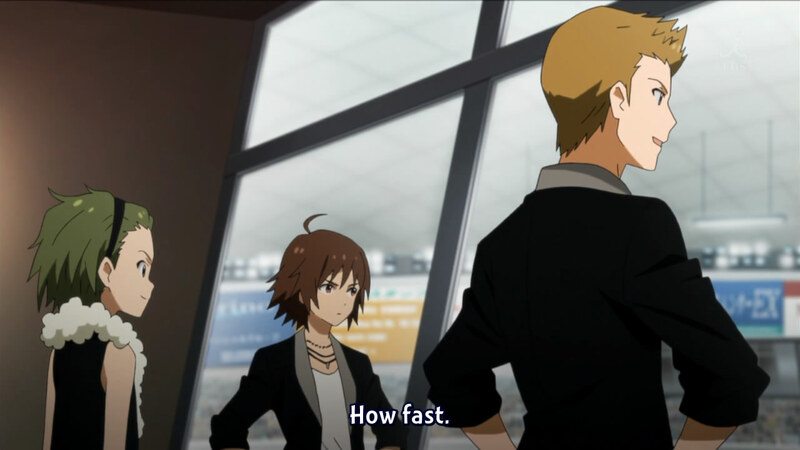 One of the boys had been seen in an earlier episode, crashing into Haruka and being generally rude. (I hope I'm wrong when I assume that they'll fall in love after this point. I hope he's just rude, nothing more.) I don't see the attraction, but my comment more has to do with the wonder that is their song - Alice or Guilty. What does that even mean? I can't even find a semblance of any underlying symbolism. Overall, it wasn't a bad episode. There just wasn't very many captivating points in it. My interest for this anime has really fallen. I don't feel like they're showing the reality of being an idol enough, though there are hints here and there, and I feel like there's a lot of story going on where I can't look. It's really killing this anime for me.